In this modern day and age, it is rare to find someone who doesn’t own and actively use a cell phone or other mobile device like a tablet or e-reader. People do not only use their mobile devices to call, but also to text, play games, and access the internet. This includes checking their emails. In fact, anywhere between 15% and 65% of all emails are opened via mobile devices. If your business has not yet altered your email marketing to be more mobile friendly, you may have a lot of emails going into your customer’s trash folders. Obviously, your email marketing will do you no good if your customers are not even seeing them, so now is the time to get with the program. Not sure where to start? 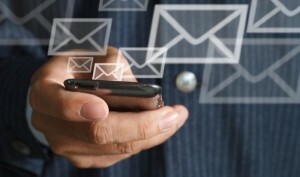 Check out these five great tips on crafting mobile-friendly emails to get on the right track. The subject line is like the title of a blog post or article. It needs to grab your reader’s attention immediately and make them want to find out what you have written. If people don’t have their attention grabbed they probably aren’t going to open up your email. The truth is that each and every one of your customers is probably subscribed to several other email newsletters and most of them end up in the trash bin. Make yours stand out in a crowd of similar items by paying strict attention to the subject line. The most effective subject lines will accurately portray the topic your email is covering, be unique, grab your customer’s attention, and hold that attention. Many people fail to recognize this important aspect of email marketing. While always important, the preheader is even more crucial when dealing with mobile viewers. The preheader is the text just above the header image. It is what your users will have a chance to read prior to ever opening your email. Most preheaders say something like ‘click to view this in your browser’ or something along those lines. Instead of that dull, exhausted text, try something new. It should be eye catching and work with the subject line to get people to view your email on their mobile devices. It could be humorous, interesting, dramatic, informative, etc. Just be sure it is an attention grabber. A call to action will tell the reader what you want them to do once they finish reading your email. It might redirect them to an article on your website, prompt them to check out a type of product or service you offer, ask them to follow you on social media, or anything else. These small few lines at the bottom of your email are imperative because they will continue to engage your customers after they have finished reading your newsletter. The longer you are able to engage someone, the more you will stand out in their mind. A good call to action is strong, highlighted, brief, and straight to the point. Ditch the fluff and just stick to the basics. To highlight your calls to action you may want to think about crafting them in bold text. Images can be an extremely useful tool in your email marketing. When used properly, they can help to boost the number of users actually reading your email all the way through. When used improperly or excessively, they can absolutely destroy any chance you had of getting your email read. Images should contribute to the content, not take away or distract from it. While you should ensure you have at least one or two high-quality images in each of your emails, you also need to be sure you are using them sparingly. Use your best judgment or ask a graphic designer to determine whether you have too many, too few, or just enough images in each email. Many people have become extremely fond of the ‘unsubscribe’ button. They click away, even before they actually read your email or have given your company a chance to offer them valuable information over the course of time. Because of this, it would be wise of you to hide that little button away. It should still be accessible, should your customers really want to use it, but not right out in the open where they may be tempted to click on it just because. Definitely be sure the unsubscribe link is nowhere near your call to action. A great idea is to hide the link away in your other links at the bottom of the email. With so many users checking their email via mobile devices, it is imperative you get with the program. Use these five important tips to help create emails which are more mobile-friendly. Always start with an eye-catching subject line and preheader. Use strong calls to action, an appropriate amount of high-quality images, and always be careful of where you place the unsubscribe button.